Home » I-95 Express Lanes are now open! The I-95 Express Lanes have finally opened, running from Edsall Road in Fairfax County to Garrisonville Road in Stafford County, spanning 29 miles. The new lanes will connect to the 495 Express Lanes into Tysons Corner, in addition to other major employment sites in Virginia along the way. Vehicles with three or more people will be able to use the lanes for free, while those with less than three can pay a toll to use the lanes. Similar to the HOV lanes, the Express Lanes will reverse direction according to the morning and evening rush hour traffic. The only requirement for all drivers is that they must all have an E-ZPass as there will not be any toll booths with the option to pay cash. The idea is to do everything electronically through E-ZPass to keep traffic flowing as efficient as possible. For those with three or more people, as long as they have an E-ZPass Flex set to the HOV mode, they will be able to travel on the Express Lanes for free. 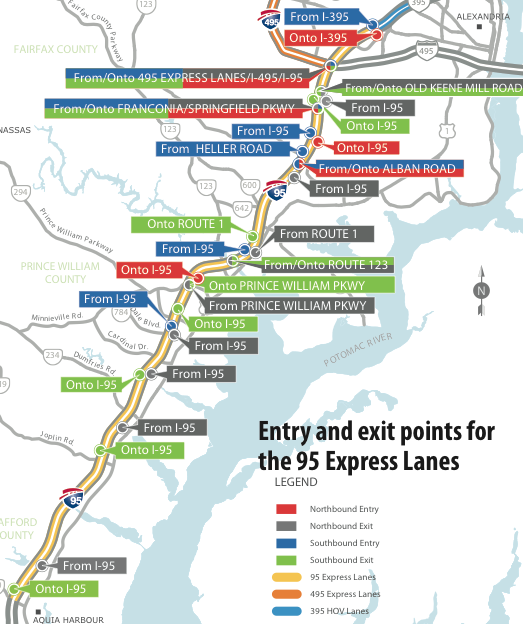 For more detailed information on the I-95 Express Lanes and the rules and regulations of travelling on them, make sure to visit the Inside Nova website here.